Some folks will prefer digging inground garden beds simply because they love both the physical labor involved and they simply love playing in the dirt. When digging to put an inground garden in an area, remember that you're bound to lose some of the topsoil when removing the sod. It's to be expected and you'll compensate for the loss when you amend and add some new soil to the area. Once the sod areas are removed (any grassy or weedy area needs to be cleared also), amend the soil by spreading a good nutrient rich, organic matter onto the area 2-6in deep. Till the organic matter into the soil and throughout the entire bed to a depth of about 6-12in. Another way to prepare inground gardening beds is by double digging. Yes, this method involves considerable effort yet the results will be well worth it for many years to come. Again, you'll need to remove as much of the sod as you can by using a spade or sod cutter. Using the flat-bladed spade to help keep the sides straight, dig a trench to the full depth of the spade and about 2ft wide to make it easy to stand and move around in. Remove all the soil from the trench and set it to the side to use in the last trench. With a heavy duty spading fork, stab the fork into the ground as deep as possible and rotate it a few times to break up the soil. Do this to a depth of about 10-12in. Amend the soil by spreading a good nutrient rich, organic matter onto the area 2-6in deep and fork it in also. Dig a second trench same as the first, putting the soil from the second trench into the first trench. Again stab the ground and rotate the fork in the second trench. Amend the soil and fork it in, then move to the next trench. Continue this process until the last trench has been dug, forked and amended. Fill in the last trench with the soil from the first trench. 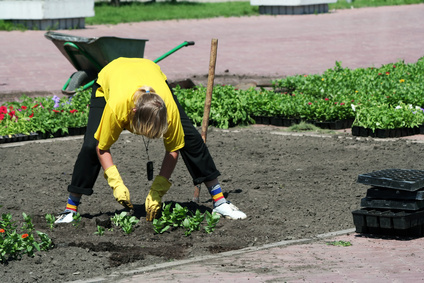 Rake the bed to even it out and also remove any grass roots or weeds that may have been uncovered. Whichever method you choose for setting up your inground garden beds, the satisfaction of seeing those first green sprouts shooting up and growing into strong healthy plants will be well worth the time and energy put into it.